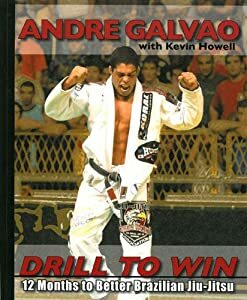 Andre Galvao Seminar "The guard is grip"
Today I attended the Andre Galvao seminar hosted by Tim Sledd and Small Axe Jiu-Jitsu. I freely admit my fondness for basic jiu-jitsu, probably because I have faith that I can do simple and screw-up complex. So when I heard lasso guard and inverted lasso guard I prepared for the probable demise and/or permanent maiming of my training partner. But a price must be paid for education. 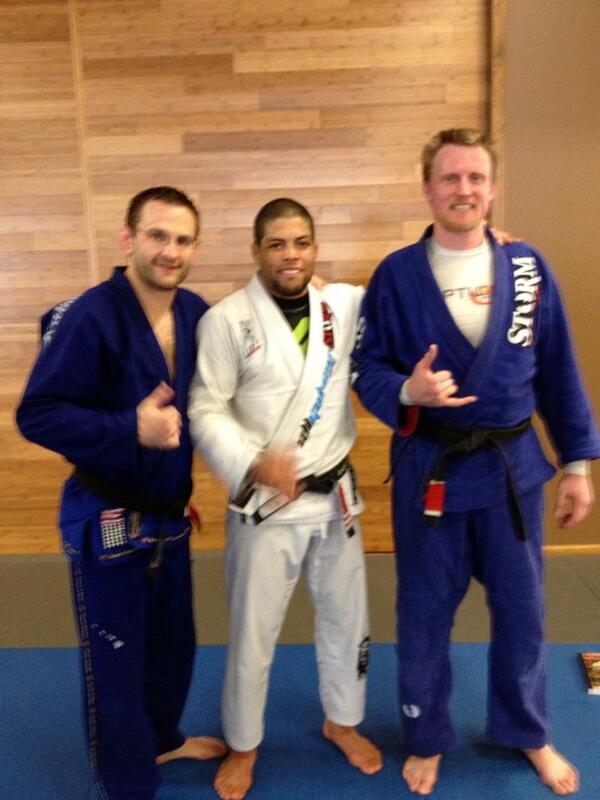 Galvao stated that getting and retaining a grip was crucial for successful guard attacks. Losing the grip typically means getting passed. It is critical to remember that the grip will lead to a high percentage guard game. To strengthen the grip it is recommended that athletes do pull-ups with a gi thrown over the bar. To do the lasso spider guard correctly, Galvao recommends bending the knees, keeping the thighs close to the body. He argues that this gives the best structure for playing from this position. We warmed up by doing lasso guard repetitions. Thus using the technique we were going to train to get the core temperature up and the joints limber. The lasso is obtained by gripping the sleeve on the outside and wrapping it with the fingers. Now bring your shin inside their cubital fossa (elbow pit), bring the knee to you and then laterally, pulling with the grip hand and applying pressure with the shin. For this drill your opposite foot is in a spider guard position in the other cubital fossa. We will now switch lasso to lasso from side to side. Bring your knee proximally, toward you, clearing their arm, now bring it laterally moving your knee to the outside and then inferiorly to their arm. Pull your knee medially and toward you, placing your foot in the cubital fossa, i.e. spider guard position. On the opposite, do the reverse: bring your leg medial to their arm, and then move your knee inferiorly and laterally to their arm. Bring your shin superiorly and medially to their forearm, placing the shin in their elbow fossa. Use your spider guard foot to help switch your body angle and make it easier to set the lasso. You will use the lasso to lasso switch, but now throwing a triangle into the mix. Start with the lasso guard on one side, and switch to the other as above. From this lasso, slide the lasso foot to their hip. Now shoot the calf from the spider guard side across the back of your partner's neck and cinch the triangle. Obtain a lasso on one side, hook your other foot on the distal, anterior side of their shin on this side (i.e. cross body). Now dive underneath by reaching your free hand to the opposite ankle, displacing the hook you placed before. You should now be parallel, but facing the opposite direction. Now rock forward, using your shin which is wrapped by their arm to pull them forward over your legs. You can triangle your leg to help you rock them forward. If your partner stalls out and drops their weight, go perpendicular and roll them sideways, over your "free" side. Do this by breaking down their knee with the hand you grabbed their ankle with earlier. Now switch to oma plata, but pull them medially and kick your free leg through. They will roll across your body. In both cases they should land supine, with you seated next to them and their arm in your popliteal fossa (knee pit). Pull it up so that your calf is under their triceps. Grab your shin with your opposite hand to keep their arm trapped, now spin backwards turning their body over and setting you up for a tight oma plata. Galvao noted that this series of sweeping and oma plata was an advantageous sequence for scoring points without ever having to pull guard if they managed to roll out of the oma plata position without submitting. It should be noted that if your partner steps to far forward to defend the sweep, you can simply wiggle through their legs and "go out the back door" to subsequently take their back. Watch that you don't leave any of your lower extremities in a position to be submitted. If you try the inverted lasso guard sweep and your partner stands to defend, they will step back with their free leg. This allows you to bring your free leg (the one not lassoing their arm) cross body, laterally and posteriorly to the leg you hooked with your arm and then bring your foot anteriorly between their legs to end up in the inguinal area opposite the leg you are wrapping. You may have to free your arm from its hooked position and grab their opposite ankle. Now bring your opponent laterally by moving your shin against their arm and lifting with your wrapping leg. When they land, free your the wrapping leg and place it on the mat. Grab their collar and pull them to you and transition to the side mount position. If you can't sweep them from here consider unbalancing them and go back to the inverted lasso guard sweep. If they step too far back and are more perpendicular to you, bring the foot through to the side of the body closest to you. Push them so that they turn away from you, release the lasso and place this shin in the back of their same side popliteal fossa. Now you can take the back, or if appropriate rank look for calf slicer or ankle lock. Beware that they can do a knee bar or ankle lock to you if you don't watch your lower extremities. Two "obvious" submissions were noted. If you go inverted on the lasso guard, you can sit laterally to go for oma plata or spin all the way through and attack with the triangle. From the lasso spider guard, tilt on the hip opposite the lasso to straighten your leg and "hook" the small of their back. Tilt back to square up with them again. Now grab the same side collar on the spider guard side and grab their triceps on the lasso/small back hook. Pull their triceps forward as you kick past their ear with your spider guard foot. Cross your ankles behind their back. Now cinch the triangle position by bringing the calf down over their neck and tucking it in the popliteal fossa of the opposite leg. You can triangle them by pulling their head down or by doing the cabana. The cabana is done by pulling your partner to you and hugging them with your arms inferior to your legs. Now pull in with your arms and push away with your legs. Obtain the small of the back hook again but this time cross collar grip. Again pull the triceps on the lasso/small back hook. Your foot should post on their hip and your knee should drop to their shoulder. Your opposite foot stays in their cubital fossa but your knee goes medially and distal to you, resting on their opposite shoulder (the same shoulder your other knee is applying pressure to. Now push their hand "into your pocket" with your near hand and transition perpendicularly as you triangle their arm by bring the foot from their hip over their shoulder. Slip the free foot either under their far axilla (arm pit) or far popliteal fossa, if you can reach it. Now place both hands on the floor ("wheelchair position") and walk away from your partner on your hands to apply pressure. Galvao stresses drilling and review. After almost each sequence he would have us attempt the position with resistance and work from there. As noted above our warm-up was lasso spider guard dexterity drills. Later, he would have us start from the inverted lasso position and make use try to sweep with resistance of first one sort and then another. He also outlined what he had covered and then let us work for 7-10 minutes on whatever material we felt most necessary for us to try again. At the end of the seminar we did a "king of the hill" with 7-10 minute rounds of winner plays from the guard. First round double sleeve control, second round lasso guard, and third round inverted lasso guard.